Our developers are always working hard to improve our plugins, and today we’re super excited to announce HUGE updates to our Chat plugin. Since we last updated you on Chat’s features, the plugin now includes the ability to control where chats appear, full BuddyPress integration, significant front-end display improvements, chat logs displayed on the front-end (helping SEO! ), specific bottom corner chat features and some very important under-the-hood improvements. In June last year we unveiled features that made Chat faster, sleeker and more customizable than ever before. We listened to member feedback and we’ve made Chat even better for users who wishing to turn their site into a fully-functional live and interactive platform. We use the Chat plugin for our Live Support sessions. Check out our Live Support calendar to join the next chat session. You asked for it and we delivered – Chat now display both a user’s avatar and name. Admins can also now hide the moderator footer completely, stop users from expanding the text area, prevent the pop out chat on individual chat sessions and choose whether to split or combine a moderator list. In earlier versions of Chat, any user could see/participate in a chat session. We’ve changed that. Earlier versions also displayed chat logs below the chat box and this was using too much space. We’ve updated this to allow admins to show a simple link to chat logs instead. Display your chat logs and boost your SEO! 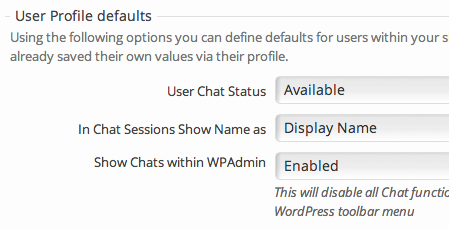 Admins can now control the display of chat within the WordPress admin area. These new options all you to prevent chat sessions from showing on various URLs. For example, you might want to prevent the bottom corner chat from showing on a page where a shortcode is used, and similar for widgets. We’ve added a heap of new BuddyPress features that allow you to control the look and feel of live chat. We’ve really beefed up the way Chat works with BuddyPress. Now you can define some default settings for group chat, with settings inherited each time a new group is added, as well as control some chat settings within profile pages. Admins can also see all users and initiate private chats directly, regardless of their friendship status. When the bottom corner chat is minimized, the number of new messages received since the chat was hidden is now displayed. This feature can be switched off for sites low on server resources. In previous versions of Chat, when a user posted a message there was a server hiccup during the AJAX send and the message was lost. Now the message is retained until a successful confirmation from the server. Chat also now has timers for how often new messages are checked versus meta information. Download Chat today and turn your WordPress site into a fully-functional live platform.